Zionism had a different kind of dream than Martin Luther King. In opposing US apartheid (called Jim Crow), Dr. King said “We hold these truths to be self evident: that all men are created equal” & “With this faith we will be able to hew out of the mountain of despair a stone of hope.” It was that kind of vision that inspired the great US Civil Rights Movement, which while it lasted ended the worst savageries of US apartheid & inspired millions of oppressed around the world to stand against tyranny & colonialism. Zionism isn’t built on equality & all that hope stuff; it’s built on a cynical & twisted sense of Jewish superiority, separating Jews from other ethnicities in a shtetl surrounded by an apartheid wall & fortified by one of the most heavily armed militaries in the world. From earliest on, those who opposed the Zionist project of Israel claimed it would be a death trap for Jews. It has proven worse than that. Right now Israel is engaged in a murderous bombing campaign over Gaza & a jackboot occupation of the West Bank, brutalizing & rounding up hundreds of Palestinians. Politicians are inciting Israelis to barbarous acts of violence against Palestinian youth as revenge for the murder of the three teenage settlers–when no investigation, charges, legal proceedings have even been initiated. In other words, mob rule is in force in place of legal justice. 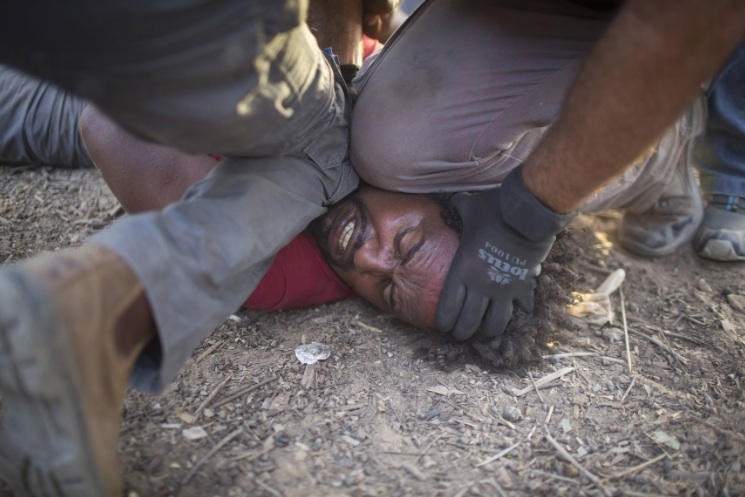 And in this photo, an Israeli cop & immigration officer brutalize an African asylum seeker who along with 1,000 others left Holot immigration jail in Israel & marched to the Egyptian border to get the hell out of the country. They preferred to return to their own war-torn countries or to make the perilous trek across the Mediterranean Sea than to stay in the hellhole called Israel. It doesn’t get more damning or more wretched than that. What a dystopic vision Zionists have for Israel: they envisioned a ghetto but they’re creating a hell on earth. Zionism used to garb itself in the mantle of freedom from persecution & even socialism, but modern Zionists like Netanyahu are no longer able to hide the putrid racism & xenophobia at the heart of their ideology. While the US bases its military policy on Islamophobia & bringing down Islamic fundamentalism, it promotes & bankrolls Zionist fundamentalism in Israel. A Jewish state or a Muslim state, based solely on religion, defies the achievements of the democratic revolutions against feudalism & signifies a political regression. Zionism also signifies an abandonment of the worldwide struggle to end racism, an ideology developed to justify the slave trade. Rather than stand with others to oppose racist ideology & practices, Zionism accepted defeat, threw in the towel, & decided to join the side of the colonizers & oppressors. The courageous & intransigent opposition of Palestinians to Zionist racism has put the lie to all this deceit & malarkey & they are now joined by African refugees who are being subjected to endless barbarisms including harassment, detention, deportation. 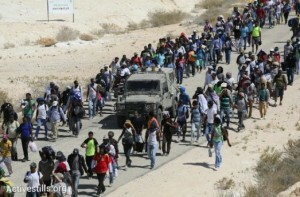 It’s so bad for African refugees in Israel that this week thousands of asylum seekers left the Holot prison for refugees in southern Israel & marched toward the Egyptian border with no intention of returning. This march exposes the Achilles Heel of Zionism, which is probably why Israeli soldiers manhandled & tried to hold the marchers back. Most of these refugees fit the UN description of an asylum seeker: they are leaving war zones & it should be added, areas like South Sudan where Israel has long been invested in economic plunder. The right of asylum is an achievement of civilization that goes back millennia but Israel, with it’s xenophobic & dystopic vision of society, believes refugees are “infiltrators,” personae non gratae & must be deported. Imagine leaving your own war-torn country & culture & having to face the edifice of Zionist fundamentalism. We hope African refugees not yet deported & still in Israel will forge political solidarity with Palestinians despite the impediments Israel is surely using to block such unity. There are many people around the world hoodwinked by Zionism’s cynical manipulation of the holocaust & endless pogroms against Jews who would find racism toward Palestinians & Africans damnable if they knew about it. By every civilized societal standard, those African refugees deserve asylum but they’re not likely to get it under Zionism. That will require a democratic secular state where all men, women, & children–of whatever religion or ethnicity–live together as brother & sister. That’s the vision Zionism abandoned for a shtetl surrounded by an apartheid wall. Our fullest solidarity with the African refugees.